In the following article it shall be outlined that Social TV, i.e. 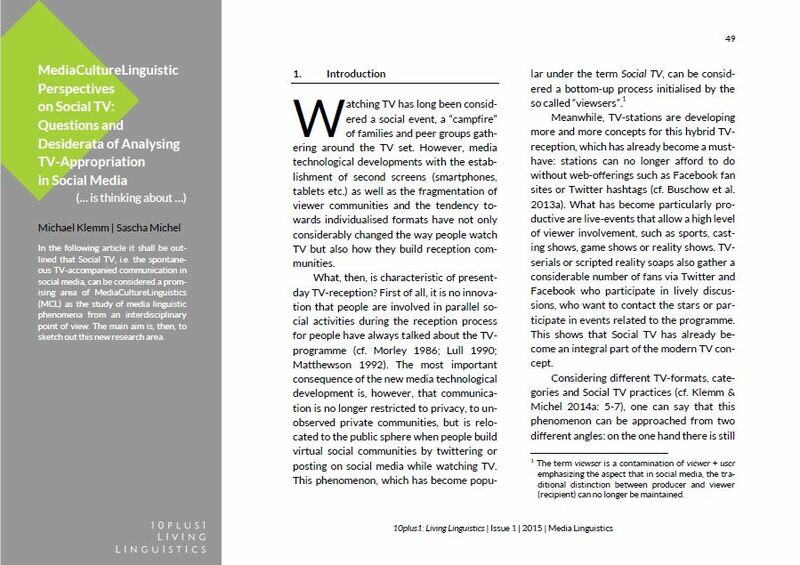 the spontaneous TV-accompanied communication in social media, can be considered a promising area of MediaCultureLinguistics (MCL) as the study of media linguistic phenomena from an interdisciplinary point of view. The main aim is, then, to sketch out this new research area. Michael Klemm is professor for media studies on the institute of Kulturwissenschaft of the university Koblenz-Landau, Campus Koblenz. Studying German philology, political science and media communication on university of Trier, 1998 Doctorate on the TU Chemnitz with the dissertation on „Zuschauerkommunikation“. Recent research and publication areas: Social Media (in political communication), analysis of multimodality / cultures of audiovisuality, international and transcultural media culture(s), media appropriation. Sascha Michel is research assistant for media linguistics on the institute of Kulturwissenschaft of the university Koblenz-Landau, Campus Koblenz. Studying German philology and English studies. Recent research and publication areas: political language and communication (especially in Social Media), analysis of multimodality, media appropriation (especially Social TV). Recent publications: Girnth, Heiko/Michel, Sascha (eds. ): Polit-Talkshow. Interdisziplinäre Perspektiven auf ein multimodales Format. Stuttgart: ibidem; Klemm, Michael/Michel, Sascha (2014a): „Social TV und Politikaneignung. Wie Zuschauer die Inhalte politischer Diskussionssendungen via Twitter kommentieren.“, in: Zeitschrift für Angewandte Linguistik (ZfAL) 60, 1/2014, 3-35; Klemm, Michael/Michel, Sascha (2014b): „Medienkulturlinguistik. Plädoyer für eine holistische Analyse von (multimodaler) Medienkommunikation“, in: Benitt, Nora et al. (eds. ): Korpus – Kommunikation – Kultur: Ansätze und Konzepte einer kulturwissenschaftlichen Linguistik. Trier: Wissenschaftlicher Verlag (WVT), 183-215.